I woke up with little butterflies in my stomach, the kind of butterflies that I get when I am about to set off on an adventure. You see, Lucas and I had the grand idea that we would rent a buggy — a popular thing to do when in Buzios — and drive from beach to beach. We were after all on a quest to find our favorite! Our pousada called the rental company for us and by the time we were finished with our breakfast the buggy had arrived. We spent about an hour filling out paperwork and once we had signed away our lives the keys were presented to us. I was the one driving, since Lucas lives in Buenos Aires and therefore has no need for a driver’s lisence. As we got into the buggy my excitement turned to dread, as our buggy was not an automatic. Yes, I know, roll your eyes and laugh, but I do not know how to drive a stick shift (it is on my Bucket List to learn by the way). Lucas tried to teach me, though that was an absolute disaster. After yet another hour, I finally gave up and had to embarrassingly call the rental company to ask for a refund and for them to pick up the buggy, while in the meantime I left it stuck in the middle of the road on a hill. Not one of my proudest moments! The difference between tragedy and comedy is a sense of humor (which thankfully both of us have). As many travelers have learned while on the road: the worse the experience, the better the story. Since it was already mid-afternoon, Lucas and I decided to stay where we were to take advantage of the incredible pool at Casas Brancas and to continue laughing off the unsuccessful morning with some caipirinhas. I know I have done nothing, but sing Casas Brancas’ praises for the last several posts, however I simply cannot imagine a more aesthetically pleasing place. Towards the end of the day the beach along Buzios Bay was calling out to us and we decided to pay it a visit. It took us about fifteen minutes to walk there. It was not the most beautiful beach I have ever visited, however the calm water was the perfect temperature. Lucas and I floated away the time and before we knew it the sun began to set. And the walk back to our pousada was illuminated by yet another pink sky. By the time we made it back to our room the moon was now the center of the attention in Buzios. Lucas and I were surprisingly tired and decided that we would have a long, leisurely dinner and then buy some cake at a nearyby bakery to take back to enjoy on our terrace. As we indulged in our desserts under the moonlight, we found it difficult to believe that tomorrow would be our last day in Buzios. We knew we had to make it special, and special it would definitely be! Oh no! Lol those silly manual cars! Sorry your plan to find your perfect beach didn’t quite pan out. It looks like you still had a fantastic day, though! 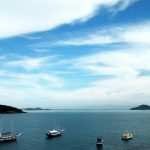 Buzios Brazil is now on my travel lust list! What a romantic holiday. Love the bikini! I am really enjoying driving around in a manual car again. You must learn. I can’t help but feel like I am a racing car driver on a grand adventure each time I drive. The sunset pictures are breathtaking! Beautiful suit, beautiful place and beautiful photos! Glad you could laugh it off and sounds like the alternative was just as enjoyable! i had a similar experience having to drive a stick for the first time in the Czech Republic in the snow and uphill! Good try anyway… your night time outfits are so cute! Okay if we do make it to BaAs at the same time you are taking me shopping, I love your vacation clothes! And yes, I agree with Ayngelina, you always have the best vacation wardrobes!!! Casa Brancas is STUNNING! What if you got married there?!? Oops, didn’t mean to post twice, sorry! You’re being attacked by Kyle comments! What amazing photos! And you look stunning! I wish I looked like that while I travelled!! Looking fab! Love the sunsets…*sigh* beautiful! It looks like you had a lot of fun. I hope you last day was super special! Learning stick shift is a stressful endeavor that should be done first in a safe parking lot. Definitely not something you want to learn while trying to enjoy a day traveling in a foreign country. Glad to hear you made the best of the day. I love your soundtracks to your posts. You really do look gorgeous! I have never learned stick shift but I am curious to try. Oh Andi, your blog is like a breath of frsh air! Okay, that’s it. 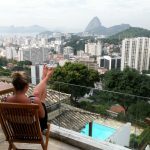 I’m officially adding Casa Brancas and Buzios to my “must visit” list! This blog seems to get a large ammount of visitors. How do you advertise it? It offers a nice unique spin on things. I guess having something real or substantial to post about is the most important factor.